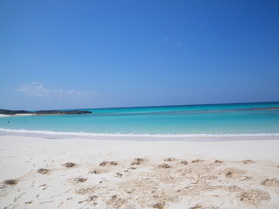 Ben Bay Beach a small crescent shaped sandy beach at the northern tip of Eleuthera that is well sheltered from the wind. It is one of the best spots we have found for swimming because it has a soft sandy entrance but drops off quickly. You can also snorkel around the rocky edges that surround the bay. To get here head north past Lower Bogue, at the Texaco station keep left and head up the highway for about 5.8 more miles. You will reach a T in the road, where the main road makes a 90° turn to the left. Follow it to the left and after 0.3 miles you will see a road to your right, take it. Follow this road 0.2 miles, until you reach another fork, stay left and continue on for another 0.15 miles. You will reach another fork, this time take a right, you will be traveling on a dirt road through a private orchard, please respect their land and their crops and don’t stop for a taste! Follow the road for another 0.2 miles (you may pass another road to the right) then take a left. Go another 0.2 miles and you will be at Ben Bay. If you get lost go back to the main highway and follow it for another half mile till you get the Jean’s bay dock. Go in the liquor store, grab an ice cold beer and ask for directions. 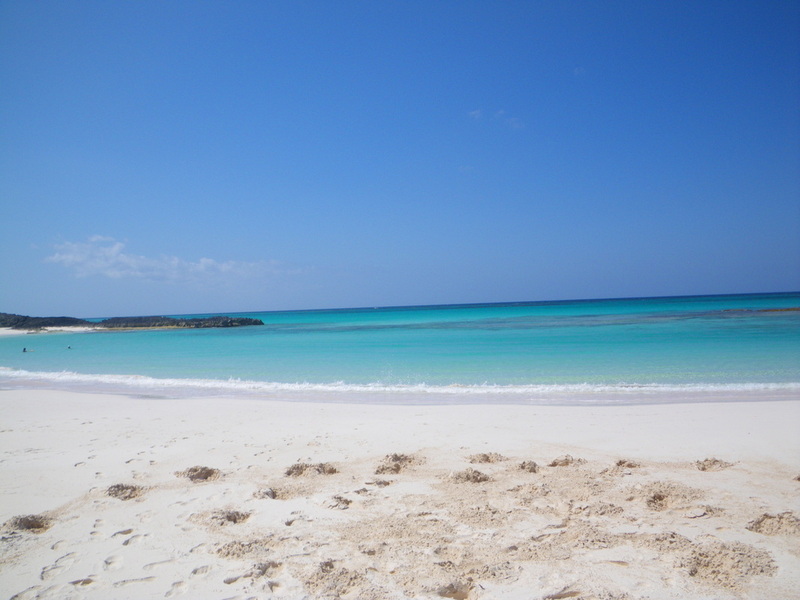 Tay Bay beach is a beautiful pink sandy beach at the northern tip of Eleuthera. It is a lot larger than Ben Bay but it does not have the protection from the wind or snorkeling opportunities that Ben Bay does. There is one large beach at Tay Bay and then a couple of smaller ones to the left. Not far off shore is the Devils Backbone a large chain of shallow reefs that is notorious for causing ships or all sizes to wreck. found shelter and a place to hold their religious services in Preachers Cave. 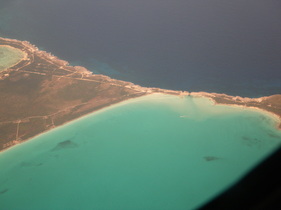 Yearly religious services were held here for the next century to mark the day they arrived on Eleuthera. To get to Preachers Cave head north 5.8 miles past the North Eleuthera Texaco Station. When you reach the T in the road, take a right, leaving the main road. Continue straight for 1.7 miles, and you should reach a tiny remote 4-way intersection. There should be a small sign that says Preachers Cave and Beach. Take a left at this intersection towards the ocean, in about 0.25 miles you should be there. For more information about the shipwrecks and caves and historic ruins on Eleuthera take a look at Project Eleuthera. hurricanes broke off a piece of the natural bridge and it was repaired with a man made concrete bridge. Hurricanes’ Andrew (1992) and Floyd (1999) took their toll on the bridge and by 1999 all that remained of the natural bridge was completely destroyed. Because there are no reefs on the Atlantic side in this area to buffer the waves, they get tunneled through the small opening by the bridge and come crashing into it at full force sometimes reaching heights of 100ft or more. The bridge is under constant repair due to these huge waves, which are called a“rage”. Many people and even vehicles have been washed off the bridge and hurt or even killed by getting too close when there is a rage. It is well worth the trip to Glass Window Bridge just to see the spectacular contrast between the calm clear Caribbean side and the dark rough Atlantic side, just make sure you go on a calm day and even then keep your eye open for rogue waves while in the area.